And thus another two-cour show from the Spring season comes to an end. This actually aired Tuesday, but I didn't get around to watching the finale because I watch this with my brother and there were some conflicts of schedule. I'll just give some short thoughts on the Bog Arc, since it was almost twice as long as the Chinchiro Arc, and I've said some things on that already. 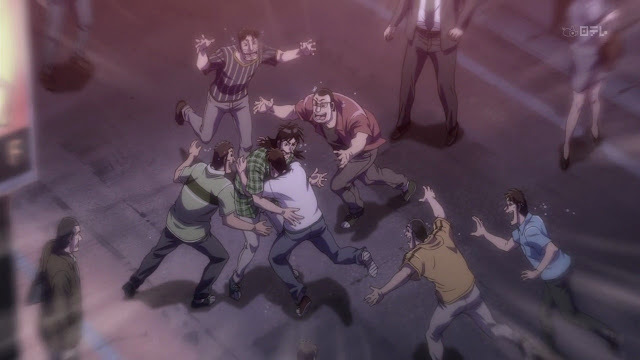 To some up the final episode: Kaiji got shafted again, but ends up with enough to save the 45s and Ishida's son. I'm betting you all knew something like this would happen. 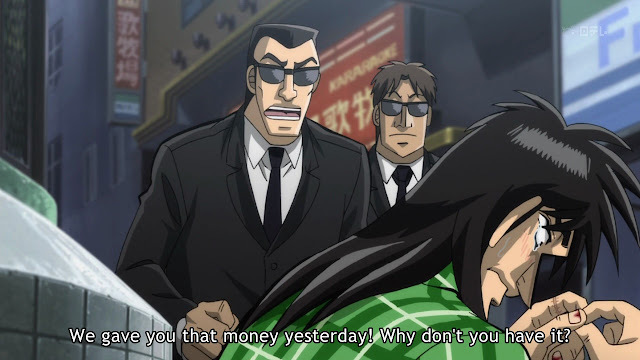 I mean Kaiji actually getting a hefty sum of money? That's preposterous! Though the person had to be Endou, since Kaiji blindly signed the contract without reading it over carefully. This pretty much just reiterates what type of character Fukumoto wants to paint Kaiji as. He's suppose to be a lazy good-for-nothing scum addicted to gambling who's going nowhere in life. However, when push comes to shove, Kaiji amazes by his sheer genius. 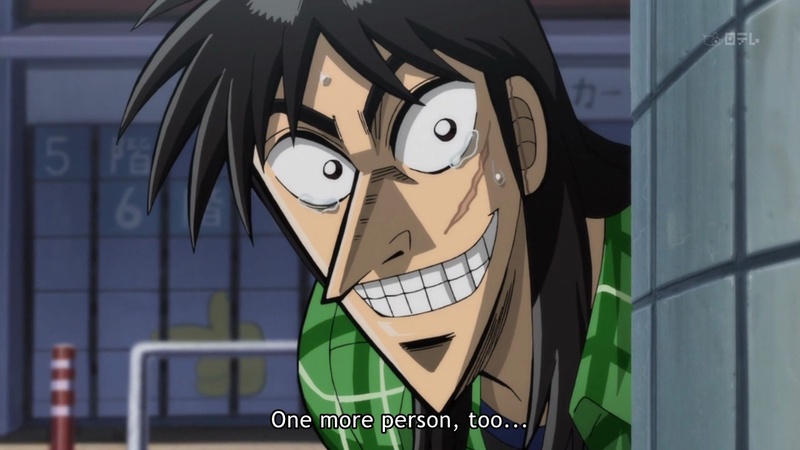 Remember when Kaiji thought he was going to lose to the Bog? He was literally begging Ichijou to call it a draw. Very typical of Kaiji, but he's able to pull out a win in the end. Kaiji's major flaw is that he trusts people too easily. Endou even explicitly says that he's too naive. Sakazaki said it was "eat be eaten." And who could forget Andou from the first season? However, this is a trait that can be looked at both ways. We all sympathize with Kaiji because he's very good guy, and that was on display in the finale: he cheered on Ichijou, and he kept his word to the 45s and Ishida. Just look how happy he is in the picture below. So was the Bog Arc long, or what? I did a marathon of the first season so it didn't feel that long, but waiting for an episode a week really highlights how drawn-out this arc really is. Fukomoto used everything imaginable to set the twists and turns in this bout between man and machine. I really think it's incredibly set up. Despite being so long and dragged out, even with some episodes with nothing happening at all, there was always some kind of excitement. The shifting of tides for and against Kaiji's favor was riveting to watch. The one strategy that I gaped at was actually tipping the building with the water tanks. I mean, who actually thinks about tipping when they want win a game of pachinko? I just couldn't help but laugh out loud at this scene; Kaiji is just too moe. 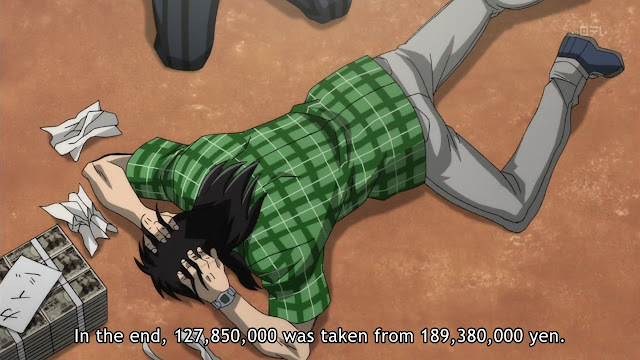 He just beat the bog for over 700 million yen, yet he loses the little money he has left playing pachinko. Oh, the irony. I guess this really shows the underlying secret of the genius of Kaiji, and by proxy Fukumoto. The opponent has to be cheating, in one way or another, for Kaiji to form a legitimate counter-strategy to beat them. This results in an incredible battle of wits that's extremely entertaining to watch. Overall, I had a lot of fun watching this season and I certainly do expect the same from any future seasons. Compared to season one, it was really the same style of storytelling, but with a greater emphasis on metaphors and stepped-up animation and music. I'll refrain from giving it any rating because you really can't compare Kaiji (or any other Fukumoto-esque works) with other anime; they're just plain different. Honorable mentions to Ohtsuki and Ichijou for being the "villains," and to Endou for pulling a fast one on Kaiji. 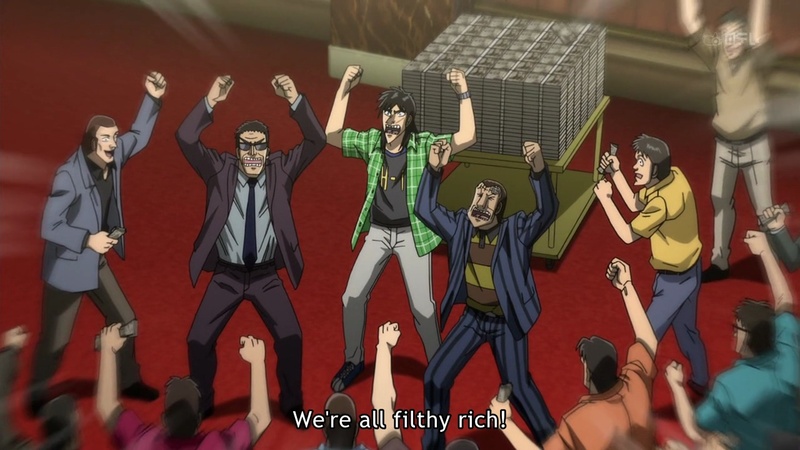 If there is a third season, it should be interesting, because Kaiji is pretty much back at square one with no debt. 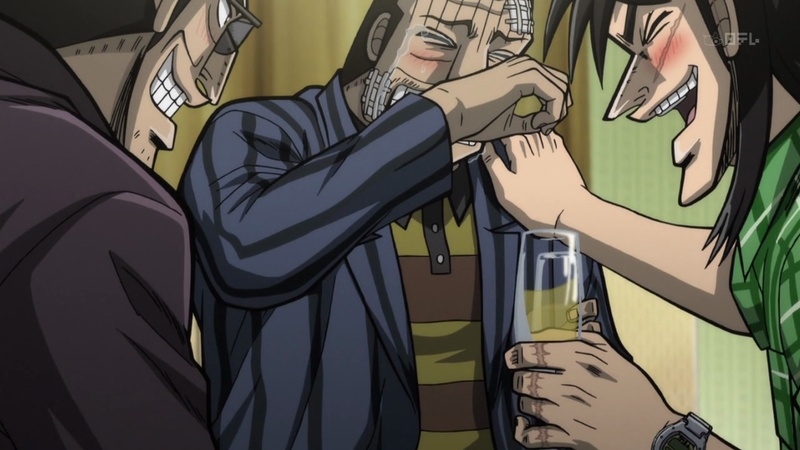 I hope you enjoyed riding the ups and downs with Kaiji as much as I did.